Over the past few days Dee and I have been in Aberdeen, Scotland celebrating the life of her lovely Gran, who sadly passed away while we were on holiday in Canada. While there we were lucky enough to be staying in a beautifully located cottage in Catterline, a coastal village situated around 3 miles south of Stonehaven. 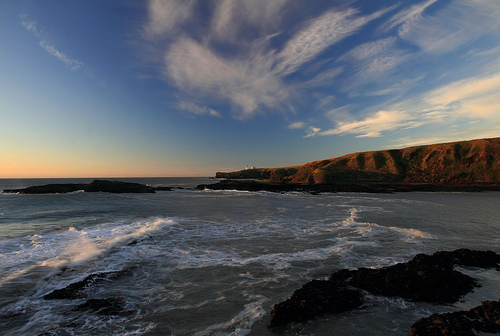 Later in the evening after the funeral we enjoyed a pleasant walk around the cliffs at Tod Head Lighthouse before enjoying a fantastic locally caught seafood meal with the family at the Creel Inn. With our flight home not until late evening the following day we had a perfect opportunity to spend the time exploring the coastline locally and further south around Montrose Basin. Fulmar - Plenty of nesting birds on the surrounding cliffs. We began the day with a visit St Cyrus National Nature Reserve: Set at the mouth of the River North Esk, the reserve sweeps around the sandy shore of the Aberdeenshire coast, just north of Montrose. The reserve comprises of towering volcanic cliffs, beautiful beach and a landscape of sand dunes and flower-rich grasslands, quite a stunning place to be. We took the Tyrie Trail a mile or so walk, diverting down to the shoreline and then back across towards the Nature Centre. St Cyrus boasts over 400 species of butterflies and moths, but sadly for us with overcast skies and a temperature of only 12C, not a one was on the wing! Bird species of note seen during our visit included: Common Buzzard, Peregrine, Fulmar, Gannet, Arctic Tern, Curlew, Oystercatcher, Meadow Pipit, Skylark, Sedge Warbler, Common Whitethroat, Reed Bunting and Yellowhammer, strangely and despite Stonechat being a regular here, none were seen. 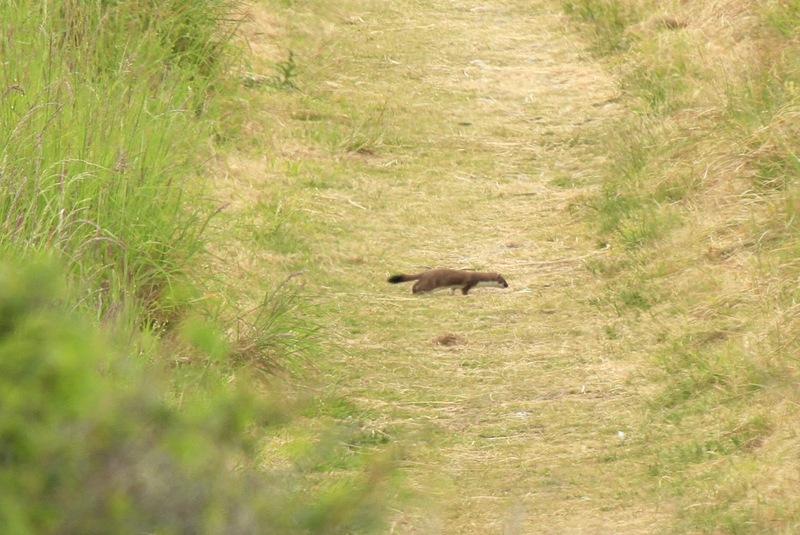 Other highlights of our walk were a couple of Roe Deer and a very busy Stoat, who the local birds seemed to be giving a hard time to. Deer - The family were around too. After heading off to Montrose for lunch the weather had brightened and warmed considerably by the time we reached the Montrose Basin Visitor Centre. This area is an enclosed estuary of the South Esk and covers over 750 hectares. With plenty to explore we decided to drive to various sections, stopping at one point at the Bridge of Dun, which overlooks the River South Esk. Here a couple of Common Sandpiper were feeding below, along with good numbers of House Martin and Swallows. Spotted Flycatcher - Surprise of the day. Parking not far from the Caledonian Railway Museum we took the footpath which leads down to the Shelduck Hide, about a 2 mile walk. On route to the hide, Spotted flycatcher, ♀Marsh Harrier, Common Buzzard and plenty of Yellowhammer, Linnet and Meadow Pipit in what had now become a gorgeous summers day! The local meadows looked wonderful in the sunshine, with the odd Brown Hare appearing within the gaps and despite plenty of wild flowers and a temperature now around 21C, the lack of butterflies was a worry, with only a single Small Tortoiseshell seen! We arrived at a deserted Shelduck Hide which offers good views of the basin and the River South Esk. Here Redshank, Curlew and Oystercatcher were feeding along the margins and a pair of Red-breasted Merganser, several Shelduck and a lone Little Grebe were also close by. A family of young Eider Duck were basking in the sunshine and the usual Black-headed and Herring Gulls were also in good numbers, no Terns were seen during our 30 minute stay! Finally, running out of time and heading back to the airport Dee and I made a short stop at RSPB Fowlsheugh, a place we know quite well. 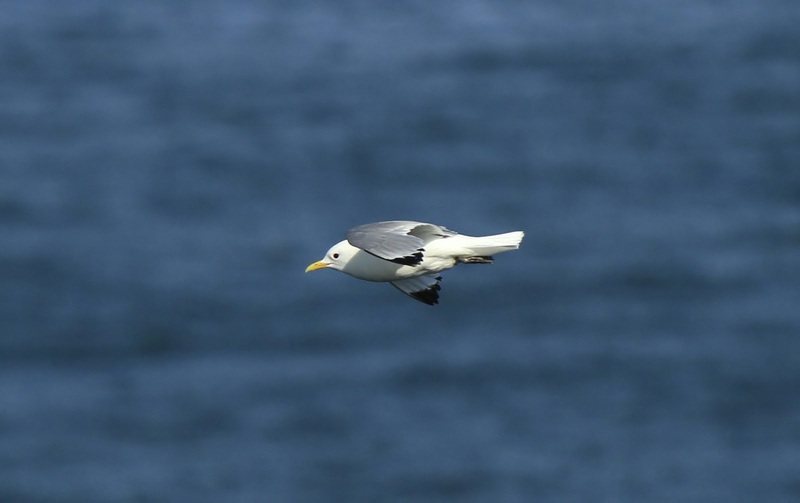 The place was the usual cacophony of noise with thousands of seabirds in the air, on the cliffs and on the sea: Razorbill, Puffin, Guillemot, Fulmar and Kittiwake, a spectacular seen! 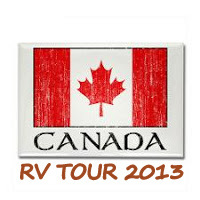 Our Touring RV - Home during our Canadian tours! As you would imagine the province offers wonderful birding opportunities with delightful coves and inlets, plus many lakes and mixed forests. I couldn't even hazard a guess at the amount of times we parked up to go hiking. 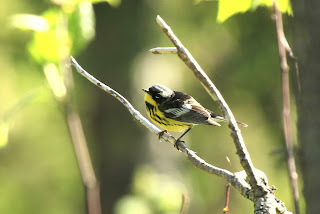 The campgrounds too are always a perfect place for an early morning or late evening walk, but with the tree's in full bloom and most North American Warblers preferring mid to high canopy, the birding was hard work. A little advice if visiting, take time to learn your bird song, this was our main armory in our searches and helped us identify many species. 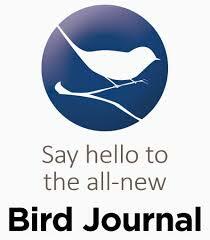 We spent a little time each evening using the excellent E-Bird App or the Sibley's Guide for Ipad listening to our target birds for each day before heading off. 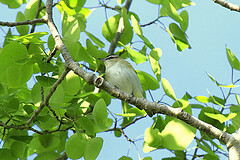 Red-eyed Vireo - Typical bird of high canopy and easily located by it's constant song! Cape Breton Highlands National Park is worth a special mention. Its spectacular highlands and ocean scenery, steep cliffs and deep river canyons which carve into a forested plateau bordering the Atlantic Ocean makes it a special place of beauty. 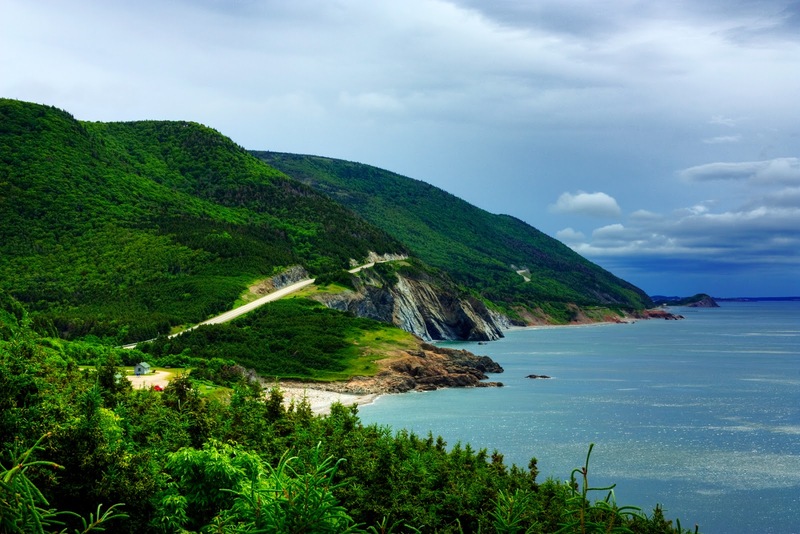 One third of the Cabot Trail, a world-famous scenic highway, runs through the national park along the coasts and over the highlands. I can tell you that Cape Breton certainly lived up to it's reputation! Cedar Waxwings are commonplace and during our four days stay in the park we encountered stunning sunsets, pollution free amazingly clear skies, plus beautifully coloured Warblers, Finches and marvelous Raptors. Many Butterflies were on the wing throughout our tour, the most popular being the Canadian Tiger Swallowtail and we also encountered other wonderful species such as: Garter Snakes, Green and Spring Peeper Frogs, Minke Whale, Dolphin, Harbour and Grey Seal, Red Squirrel, Chipmunk and achieved something our four previous visits to Canada failed to yield, our first Moose! Bull Moose - A stunning find thanks to Dee! The weather during our stay also lived up to expectations with beautiful hot sunny days, foggy, misty, damp ones and even the remnants of a tropical storm, which hammered us for over 36 hours. The black flies, ticks and mosquitoes are also worth a mention and something that needs consideration if you plan to visit. In conclusion Nova Scotia is a beautiful province with stunning scenery, outstanding coastline and amazing diversity, a wonderful experience. I would certainly plan any future visit to coincide with the spring or autumn migration as the lack of waterfowl, shore and sea birds was to be honest a disappointment. Would I visit again? Yes, but my heart will always be on the west coast of this amazing country. It's been a few days since we returned from our latest RV Tour of Canada and time to reflect on our first visit to the east coast.When Dee and I were planning our 5th visit to Canada, previously all western interior to coast destinations, our criteria was simply to base our next visit almost entirely around the ocean and in particular the east. It was Dee who came up with the idea of visiting Nova Scotia, one of Canada's three Maritime provinces and the most populous province of the four in Atlantic Canada. However, this particular destination was a slight risk! 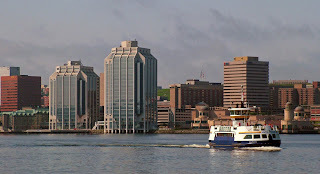 Firstly, would the birding and wildlife be as prolific as the west, secondly for Dee and I who love the wilderness aspect of our Canadian tours, would it be too built up and lastly, due to the modifying influence of the sea Nova Scotia is also very foggy in places, with Halifax averaging 196 foggy days per year and Yarmouth 191. 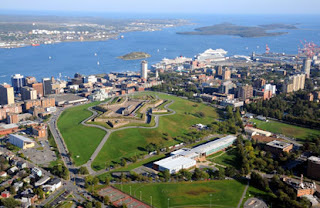 We spent our first couple of days acclimatising ourselves and sightseeing in the province capital of Halifax. Mind you one of the benefits of the east coast is the time difference and unlike the 8 hours of British Columbia to the west, Nova Scotia is only 4 hours behind and so not such an issue. 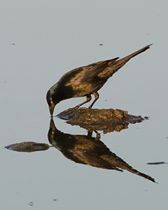 In fact the birding got off to a good start too, when while sitting out having dinner on our first night (5) Common Grackle flew over the restaurant, a first for Canada. Thanks to Ronnie Dentremont for the image. On arrival mid afternoon the weather was stunning with clear blue skies and a very pleasant 26C. However, on our first full day had one of our earlier fears come to fruition? We awoke to fog! Thankfully, as is the norm here at this time of year according to our cab driver, the fog had burnt off around mid morning to produce another stunning day. 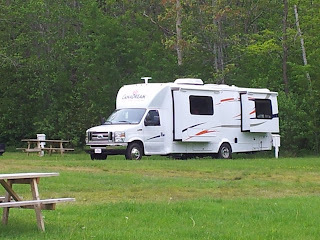 Last nights stop, which due to our detour was not part of our orginal plan, was the quaint Mountain Vista Seaside Campground, located on the shore of the St. Andrews Channel, which In fact produced Bald Eagle, Ruby-throated Hummingbirds and turned out to be a nice little overnight stop. From here it was back to the wildlife and Dee and I changed our itinerary deciding to head back into Cape Breton National Park to have another go at tracking down the illusive Moose. 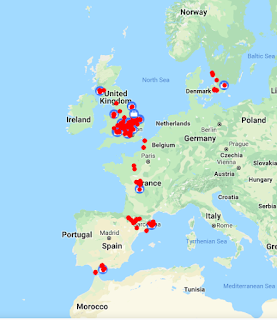 One thing we both pride ourselves on is avoiding bespoke tours and enjoy the challenge of finding our own wildlife and so with the best will in the world we were a determined team. We made an early start and prior to entering the park once more stopped at several scenic viewpoints to investigate. Belted Kingfisher, Cedar Waxwings and Spotted Sandpiper at Little River and using the back road into Belle Cote, bypassing Margaree Harbour, the brilliant sight of a pair of courting Wilson's Snipe in flight winnow, an amazing call produced by air passing through specialized tail feathers as the birds perform flight displays, a definite first for us in Canada and what a stunning thing to behold. Prior to arriving in Cheticamp a stop for lunch overlooking the Gulf of St. Lawrence provided great views of a large flock of White-winged Scoter, around 200 or so with several Black Scoter close by. More Northern Gannet, Double-crested Cormorant and unusually a couple of Red-throated Loons, when two adults in non breeding plumage were just offshore. Our next stop was to take a walk along the cliffs at Cheticamp Island and while driving across the causeway the amazing sight of a Minke Whale, when a lone individual repeatedly broke surface. 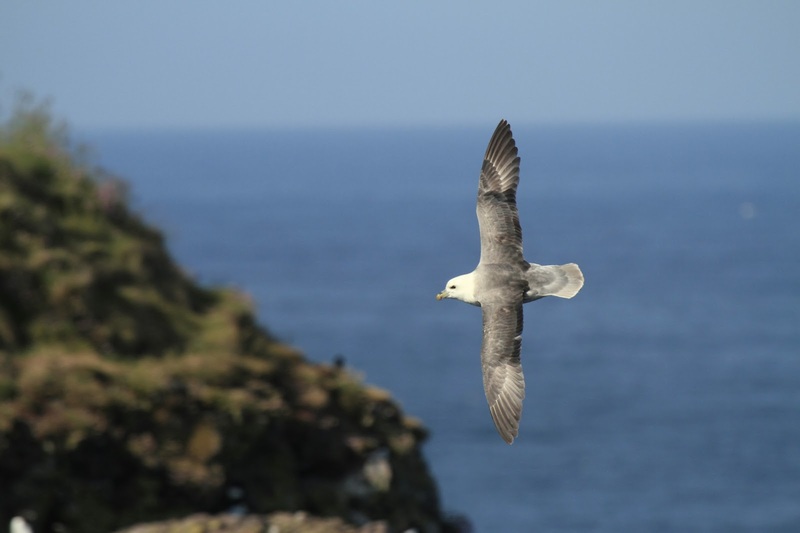 We re-located him once more after arriving atop the cliffs and while enjoying his antics spotted a couple of Dolphin just off shore. The cliffs were alive with Savannah Sparrow and Cliff Swallow, and down below Willet, Spotted Sandpiper and close views of Great Cormorant. 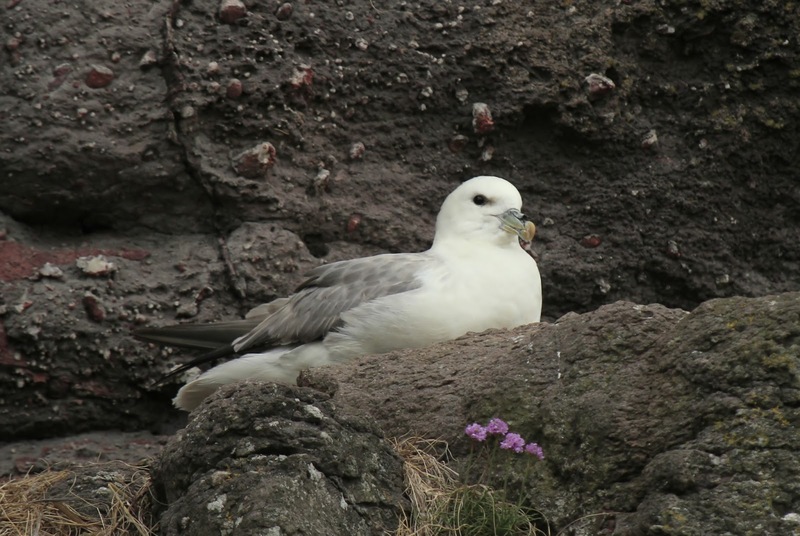 Black-tailed Kitiwake, Razorbill and Black Guillimot all seemed to be nesting on the rock face and we enjoyed a brilliant 90-minutes. After checking in and re-entering the park our next quest was to take the 7Km Skyline Trail just prior to dusk in search of Moose once more. Amazingly, just after stopping at French Lake on the Cabot Trail on route to Skyline Dee uttered the immortal words MOOSE!! Our quest for this, what we believed to be mythical creature was over, when a stunning bull Moose was stood right in front of us staying just long enough for a few snapshots, a truly amazing day's wildlife spotting! An overnight stop at Hideaway Campground and Oyster Market, which overlooks Aspy Bay at the north-eastern tip of the Cape gave Dee the opportunity to try out the local Lobster, something she's been dying to do since arriving in Cape Breton. At $7 a lobster and already cooked it was an absolute bargain and very tasty too. It's time for a few days off now from any intense birding and this evening Dee and I enjoyed a chill out around the campfire and Pizza for dinner, very classy, lobster followed by Pizza! After the superb weather over the last few days things took a turn for the worst once more on Wednesday morning and we abandoned a drive halfway up to Cape North, the most northern tip of Nova Scotia, due to the intense fog and drizzle. As we made our way back southwards, stopping at Neil's Harbour to check out the lobster fishing fleet, our first Black-legged Kitiwake. Thick pockets of fog and rain continued to hamper our journey and after a short stop at Ingonish for lunch we continued on to Baddeck for the night. Our overnight stay at Baddeck Cabot Trail Camprground was a wet and windy stop-over only made bearable by the superb high speed internet, not even a chance to explore! Thursday morning we drove into the the historic town of Baddeck, scene of the first controlled powered flight in Canada on February 23rd 1909 and as this was the second home of Alexander Graham Bell, teacher, scientist and inventor, a visit to the museum built in his honour. 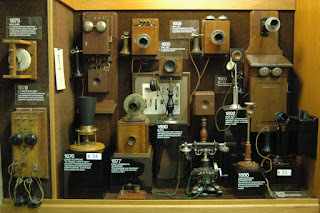 Our two hour stay was a fascinating insite into this amazing and unique character, the telephone being only one of his inventions in his incredible journey, we came away totally enlightened and in awe of this amazing Scotsman. After the museum a slight glitch into our itinerary when to our surprise and annoyance the only retailer of propane, which literally suppliers all the of RV's requirements, was no less than 55 kilometers away in North Sydney! A trip we took begrudgingly but did give us the opportunity to see the main terminal for the Newfoundland Ferry, well whatever floats your boat!! After an incredible day yesterday It was time to go exploring and after breakfast we headed off to tackle a couple of the many trails the park provides, our first stop, The Bog Trail. 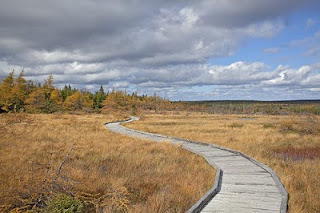 This is a self guiding walk around a boardwalk which gives you the opportunity to see the fragile life in this highland plateau bog without actually destroying any of it! A number of Dragonflies were on the wing along with stunning Orchids and plants such as Bladderwort, a fascinating species which catches aquatic insects in tiny underwater bladder-traps. By far the most interesting species on show however was the Green Frog! Dee and I suddenly heard the sound just like a rubber band being plucked, confused until realising it was coming from the male frog, who apparently calls for a female during June/July. During our 30 minute walk the first Black-and-white Warbler of our visit, plus Yellow-rumped Warbler (Audubon's), Magnolia Warbler and a fly over from Greater Yellowlegs, amazingly one of only two wader species seen thus far during our stay! A few stops at various points to admire the breathtaking scenery provided a few bonus species with Garter Snake, Tiger Swallowtail Butterfly, Ovenbird and at one point while having lunch an unfamiliar bird song alerted me to a Hermit Thrush, only my second for Canada! Hermit Thrush - Only My 2nd For Canada! After lunch on to Benjie's Trail and a relatively short 3km hike rising to around 1300ft. This is a wonderful nature trail leading you through a lush evergreen forest typical of highland plateau regions and will eventually take you to Benjie's Lake. One of Canada's rarest and least known songbirds can be found here, the Bicknell's Thrush, a small sparrow sized bird with an estimated population of only 400/500 birds. Our first birds of note during the walk were at least (3) Eastern Phoebe, Ruby-crowned Kinglet and after a short while we discovered a nesting pair of Hairy Woodpecker, not the most inconspicuous bird we've come across. The Lake provided excellent panoramic views but sadly a little late in the day for any Moose, who can mostly be found in the early morning or at dusk. Sadly, no sign of Bicknell's Thrush either, which didn't come as a great surprise as these birds are notoriously hard to find without local knowledge. Dark-eyed Junco (slate-back), Northern Flicker, Common Yellowthroat and several species of Moth and Butterfly to research before we arrived back at the RV. 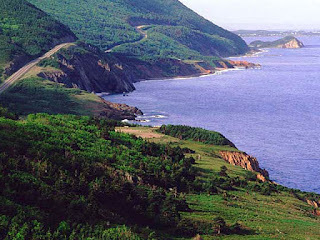 Today we'd enter Cape Breton Highland's National Park, where we intend to spend the next couple of days exploring. 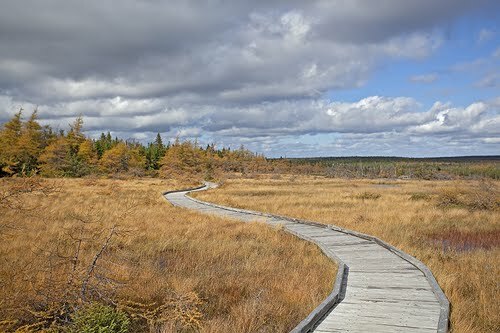 Covering 950 Sq kilometers the park is one of the largest protected wilderness areas in Nova Scotia. 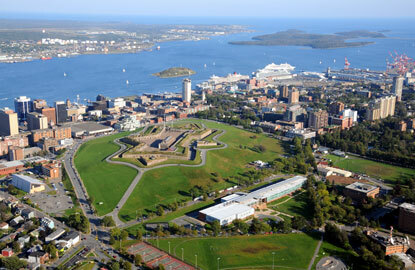 It is part of a system of national parks protecting significant landscape throughout Canada. This particular park is known for it's spectacular highlands and ocean scenery, steep cliffs and deep river canyons, which carve into forested plateau bordering the Atlantic Ocean. Dare I say even more Cedar Waxwings on route and a stop at Mabou for lunch, were the normal landscape of spruce and birch forest changed for a while to open fallow fields, yielded a lovely pair of Bobolink, my first for Canada. Just prior to entering the park a stop off at Cheticamp for a few supplies and a look around. Cheticamp is a fishing community on the Cabot Trail. The community has almost 4,000 residents, a large number of whom are Acadians and speak French natively, as well as English. Together with its smaller neighbour, Saint-Joseph-du-Moine, Chéticamp makes up the largest Francophone enclave on Cape Breton Island and it's well worth a stop. 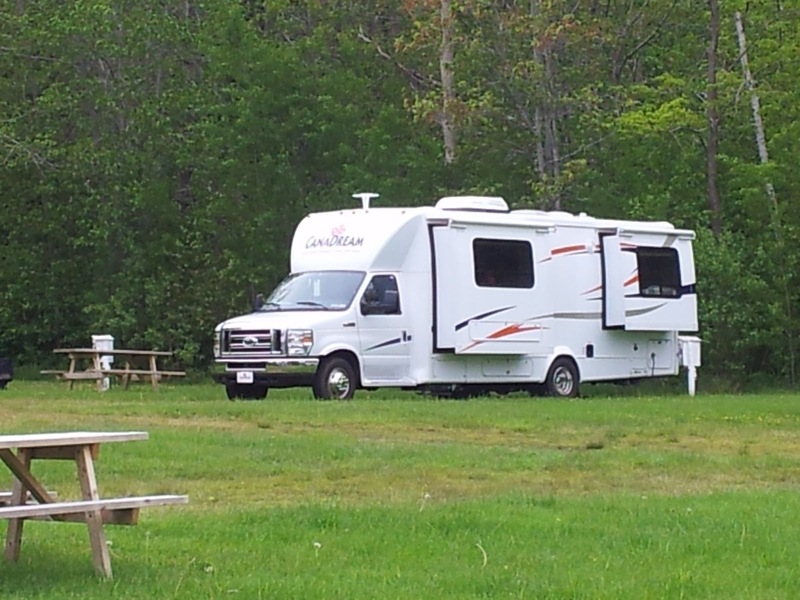 After registering at the park entrance we decided to stay at Corney Brook, a small unserviced campground we'd discovered with spectacular views looking west over the Gulf of St. Lawrence. This place was an absolute joy and Dee and I just sat out all evening with scope and binoculars overlooking the ocean in glorious sunshine and a cloudless stunningly blue sky. Gannets diving, Black Guillemot a plenty, Great Cormorant, Double-breasted Cormorant, Red-breasted Merganser and the odd Grey Seals bobbing up occasionally for a nose. We were treated to a fantastic sunset and some great views of a pair of Merlin, which were quite likely nesting locally. There are three different popultions here which differ in overall colour and judging by the colouring of this particular bird it seems likely of the Taiga variety, a bird of the east. As night fell wave after wave of Gannet and Cormorant could be seen silouetted against the orange backdrop on route to their various roosts and as the night sky emerged a new moon and a setting Venus and Mercury, the latter not often seen. One Of Many Gannet Diving For Fish! With almost zero light pollution the sky was ablaze with stars and Saturn looked amazing through the scope. A dozen or so meteors and satellites skimmed through and although not entirely sure of timings one really bright one may well have been the ISS. Not since completing a Wadi tour of Oman many years ago and visiting Kenya several times can I remember such a stunningly dark sky. This has been one of the most memorable evenings I can remember and one Dee and I will cherish for all time!